If I had to choose my family’s favorite dessert category, it would be pie. Specifially, cream pie. In fact, most of my boys will choose pie over cake for their birthdays and other special occasions. So I knew this Frozen Blueberry Cream Pie would be a big hit. With four hungry boys lurking around the house, this cool and creamy dessert disappeared in no time! I light and fluffy cream pie really is the perfect summer dessert, and this pie did not disappoint. 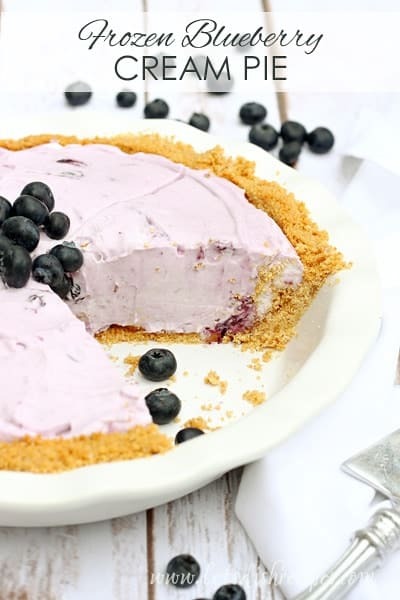 With fresh blueberries, a hint of lemon and a homemade graham cracker crust, the flavors were just perfect. Oh, and don’t forget the homemade whipped cream that’s folded into the filling! Make sure you give yourself time to cook the blueberry filling and let it cool. And you’ll need to let the pie freeze for a few hours once it’s put together, so plan accordingly if you’ll be eating the pie the same day. 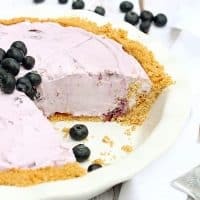 If not, it’s a great, make ahead dessert that can be assembled and put in the freezer for another time, which makes it for unexpected guests, or an unexpected pie craving! I often get people asking if they can substitute frozen berries in a recipe like this. I haven’t actually tried it, but I do think this is a recipe where that would work. 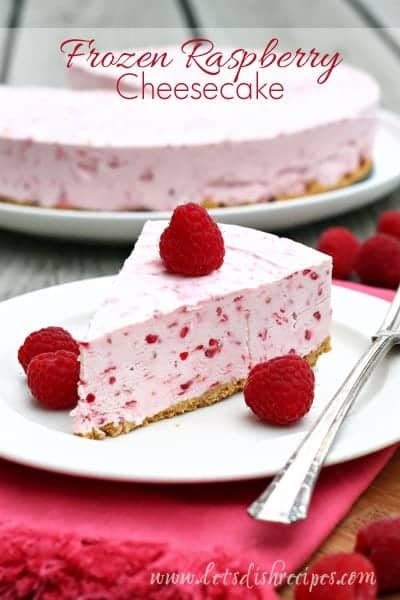 Not to mention, I’m sure this pie would also be delicious with other berries too! Preheat oven to 350 degrees. Spray a 9-inch pie pan with non-stick cooking spray. To make the crust, combine graham cracker crumbs and sugar in a medium bowl. Add the melted butter and mix well. Press the mixture into bottom and up sides of prepared pan. Bake for 6-8 minutes, or until golden. Cool completely. Meanwhile, make the filling. In a medium saucepan, combine blueberries, water, granulated sugar, corn syrup, cornstarch, and salt. Bring to a boil over medium-high heat, stirring occasionally. Reduce heat to medium-low and cook until mixture begins to thicken and berries begin to burst, about 8 minutes, stirring occasionally. Remove from heat and stir in lemon zest. Transfer mixture to a bowl, and let cool 10 minutes. Cover and transfer to the refrigerator until chilled, at least 1 hour. Add cream cheese and confectioners’ sugar to a medium bowl. Beat at high speed with an electric mixer until smooth. In a separate bowl, combine heavy cream and vanilla; beat at high speed until stiff peaks form. Fold chilled blueberry mixture into cream cheese mixture. Gently fold in whipped cream. Spoon filling into prepared crust and spread to edges. Lightly cover, and freeze until firm, at least 3 hours. Let stand at room temperature for 5-15 minutes before serving (depending on how long the pie has been frozen). To say my family loved this pie would be a big understatement. I can’t wait to try different variations–it’s such a delicious way to use up all those fresh summer berries! Don’t forget to save this recipe to your favorite Pinterest board for later.